Iron deficiency problems are appearing more frequently among bedding plants and other spring crops. The main symptom of iron (Fe) deficiency is chlorosis, usually starting at the shoot tips, but more often occurring throughout the entire plant. The leaves of some plants turn almost white in extreme cases. 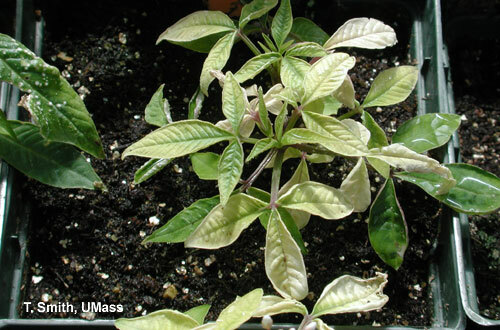 Iron deficiency symptoms appear as interveinal chlorosis of the youngest foliage because iron is needed to make up chlorophyll and new leaves expand before the iron can be taken up by plant roots. However, in all but the most extreme cases, Fe deficiency can be easily mistaken for nitrogen or magnesium deficiency, so a soil or tissue test is necessary to confirm a suspected case of deficiency. Some plants are inefficient at taking up iron from the growing media including Petunias (all types), Brachycome Daisies, Diascia, Nemesia, Scaevola Fan Flower, Paper Daisies, Argyranthemum, Calibrachoa, Scaevola, Ivy geranium, Piggyback Plant (Tolmiea menziesii), Basil, Pansy, Snapdragon and Catharanthus (vinca). There are three practices involved in preventing Fe deficiency - growth medium pH control, low phosphorus fertilization, and use of an iron chelate treatment. pH control. Acid pH favors the availability of Fe to plants, so the target pH range for these crops is fairly low: 5.5 to 6.0. Most commercial soilless media have pHs falling in this range and in most cases the use of an acid-forming fertilizer with a balance of ammonium and nitrate will be enough to keep the pH in this range. A major exception would be if the irrigation water is alkaline and then acid injection might be needed. If a grower mixes his/her own sphagnum peat-based growth medium, dolomitic limestone should be added at a rate of no more than 5 lbs./yd. Too much limestone is an aggravating factor contributing to Fe deficiency. For most growers keeping pH in the 5.5-6.0 range will be enough to prevent Fe deficiency. Low phosphorus fertilization. In certain circumstances phosphorus (P) and Fe can react together to form insoluble Fe phosphates. The Fe in Fe phosphate is not available to plants. The chemistry of this reaction is well understood in field soil, but has not been studied in soilless media. However, to be on the safe side excess P should be avoided for the Fe sensitive crops. This means that no superphosphate should be mixed in the growth medium, an acid other than phosphoric acid should be used if acid injection is practiced, and, if possible, a water-soluble fertilizer supplying no more than 10% P (I suggest 5%) should be the main fertilizer. Keeping P low will help prevent Fe deficiency, but the key is maintaining acid growth medium pH. Iron chelate. Fertilizing Fe sensitive crops with Fe from time to time is probably the least complicated and most proactive way of preventing Fe deficiency. Most greenhouse supply companies in this area carry a product called Sprint 330™ (10% Fe chelates). Verdanta OFE is an organic based, water soluble, foliar iron fertilizer with seaweed extract that contains 3% iron. Note that there are different forms of iron. The chelated forms of iron make iron available to plants at a higher soil pH than it would be in an unchelated form. Chelated forms of iron are bound to an organic molecule that helps keep it dissolved in the soil solution. As long as the chelate holds onto the iron, it is soluble and available for plant uptake by the roots. There are also different chelates available. Studies have shown the following ranking of iron forms from most effective to least effective as a corrective drench at high pH: Iron-EDDHA which is effective at media - pH above 7.0 (high solubility); Iron-DTPA is next in effectiveness; then Iron-EDTA; then Iron Sulfate. All three chelates are soluble at media pH 4.0 to 6.0. If iron is applied as a drench in a form that is not soluble because of high pH, then most of the nutrient will not be available to plants until media pH is lowered. In studies, iron sulfate tended to be less effective at increasing chlorophyll and resulted in more burning than iron chelates. Sprint 330 which is commonly used, is 10% chelated DTPA iron. It performs best in slightly acid media with a pH of up to 7.5. Sprint 138 is 6% chelated EDDHA iron for media with a pH over 7.0. The company advises not to pre-mix Sprint with pesticide or fertilizer concentrates. Follow label directions for the product you are using. Sprint 330 and similar Fe chelates are applied as a soil drench or as a foliar spray at the same rate of 4-8 oz./100 gal. (½-¾ tsp. gal.). The chelate is also soluble enough to make a concentrated solution for injection, but it must be mixed and injected by itself. Soil drench is the safest method of application; foliar sprays should be tried experimentally first to look for injury or residues. At the recommended rate, Fe chelate can be applied every 3 or 4 weeks if desired. 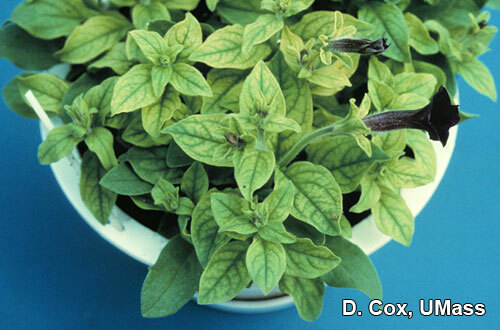 Rinse excess iron off the foliage and flowers because concentrated iron can cause brown or black spots. Iron chelate is fast acting, within a few days after treatment. It's important to apply the information in this article only to those crops known to have a special requirement for Fe. Over the past decade and even today we still struggle with some spring crops which are susceptible to Fe toxicity rather than deficiency. These crops include marigolds, zonal geraniums, and seed geraniums and their nutrition is managed to minimize plant-available Fe. This is done by keeping pH in a higher range and avoiding fertilizing with too much Fe. Applying the treatments I have described in this article to plants susceptible to Fe toxicity would be disastrous! 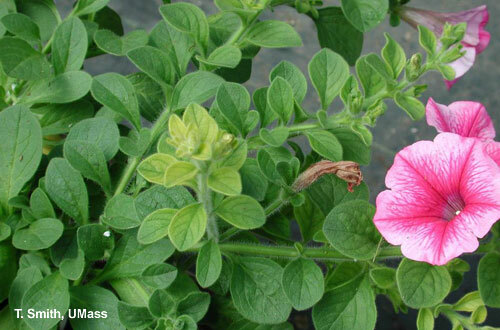 North Carolina State University has a good new article on Identifying Nutrient Deficiencies of Bedding Plants. This is a basic 4-page factsheet with a table naming sixteen essential elements for plant growth, their deficiency symptoms and corrective procedures. In PDF format, available from NCSU's Commercial Floriculture Information Center front page.